Being the dramatic exaggerator that I can be, I was seriously sad to leave Ukraine on Friday night. It had been an epic last day in the way that only Ukraine can be. Plus, I think it was one of the first moments I let myself pause. 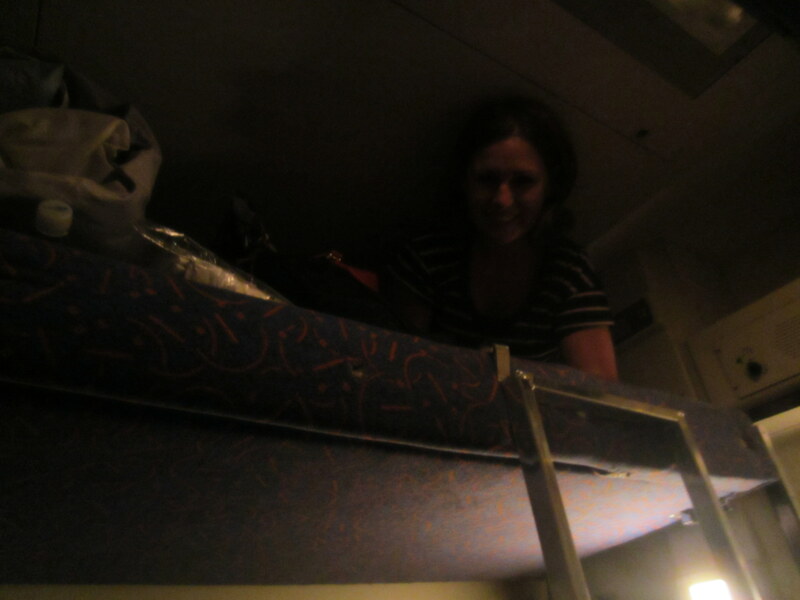 Needless to say, I was a bit lost getting on the overnight train and saying the last farewells to new friends and fresh memories. Fifteen minutes into the train ride, I was severely regretting my decision to board and not postpone my departure – I told you, dramatic. All for the better I could not alight because I probably would have gotten even more attached and pouty to leave only a few days later. After a bit of re-arranging because the ticketing process seemed to be mixed up I settled into a 3 person cabin with a friendly mother and daughter. When booking you are explicitly told there will be no mixed cabins unless you buy the whole thing. Well, when I found out I was with 2 men in tight quarters I went to talk with the attendant. He goes yeah, this is Ukraine (referring to the fact that I had purchased my ticket through the PolRail website). Regardless, I wasn’t the only one in this situation so we were all able to shuffle around and please everyone’s requests. I had also originally booked a double but after paying and a week’s time, I was emailed to say I was being put in a triple because they didn’t have doubles left. Guess the website is a bit behind on the times? So yes….after a bit of re-arranging…. I crawled into my little hobbit hole in time for us to be stopped at the border which is a serious and somewhat frightening process. I am happy I did not take the bus because at least you get to stay in your cabin on the train and doze off in between officers. There were people opening doors, then checking tickets, then taking passports, then more walking back and forth loudly and abruptly opening doors. Then there was some intermittent traveling, then someone coming in banging on all the walls and rummaging through stuff asking if we had alcohol or drugs. Finally after 1.5 hours we were reunited with our passports and receiving stamps. On the bus you have to wait in line and I have heard it can take several hours, so I was grateful though tired and startled. I dozed off for a bit which was good considering I did not want to be napping all day in Krakow. Got myself sorted and arrived at my hostel Barka Basia, which is apparently on a boat. I honestly must have gotten it confused with another one or something because I had no idea. So I am in a little floating cabin with a super sketchy co-ed bathroom situation, but the location is lovely and somehow only got charged a third of the price. I can’t say I would have ever chosen this if I realized the situation, but it is fine for a couple of nights – and the feeling of vertigo has only hit a few times. At least my bed is comfy and the restaurant makes awesome lattes (with a riverside view). Saturday I wandered. I am right at the edge of the Jewish Quarter so that is where my journey naturally began. I found a great breakfast outside the Old Synagogue which I was too hungry to tour at the time and then wandered some more. I hit up the markets and found way too many things delightful. The pictures will hopefully show you all the places I ended up since the list would be ridiculous, but mostly I just wandered and found many, many shops and gorgeous buildings. The city is truly beautiful. I found myself wandering through all the “main areas” but to be honest, I just plain didn’t feel like going up anything or into any of the buildings. Mostly I coffee-ed my way around and was happy window shopping and enjoying some sun. 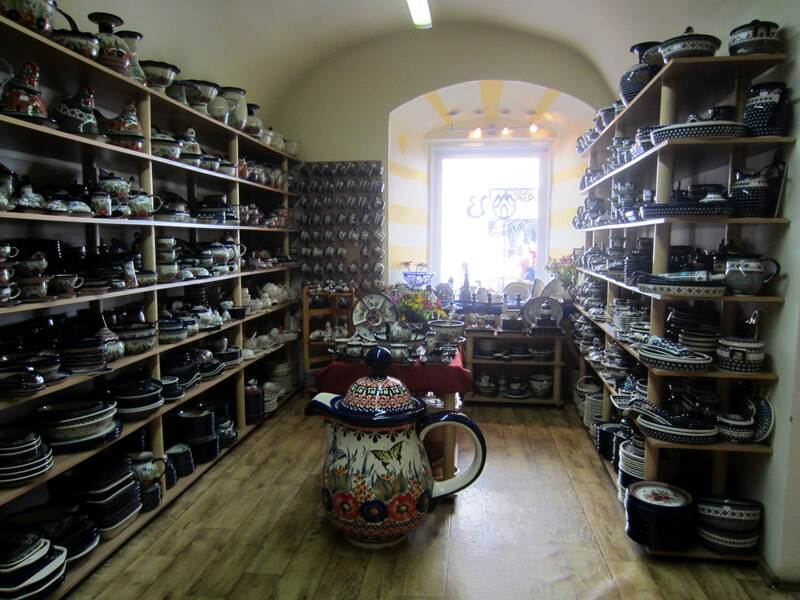 I was also on a mission to find the right store(s) for my beloved polish dishes. At the end of the day I had narrowed it down to only a couple of options left for Sunday or Monday. Sunday morning I had booked the tour to the Wieliczka Salt Mine. I decided not to do the double tour to Auschwitz after all. There are a ton of tourists about, I’m beat, and I just didn’t really want to be rushed or partake in mass tourism in a situation like that. The same held true for the day trip to Zakapone to see the Tatra Mountains. One day, in a slightly quieter season, with a small group or self driven…that will be when I do those. In the meantime, I decided I would give the salt mines a try and happy that I did. The whole thing is just for tourists so it is all very touristy, but as one of the original UNESCO sites, it is remarkable. The whole thing was quiet impressive from the size of the salt deposit, to the extravagance of some of the rooms, to the sculptures which I didn’t know where carved by the minors as a side passion after working their 8 hour shift. I didn’t lick the walls, but I was relieved that for the first time in weeks I could breath and didn’t sneeze for 3 hours straight (allergies have been crazy!!!). Some parts were rushed, but I was in a good enough mood that it didn’t seem to bother me and happy I was still making it back for a full half day in the city. I also have to take a moment to mention how easy it is to find gluten free, vegan, and various cuisines here. I usually do some extensive research on where I can find good food that fit my criteria in new cities so I think it is important to share how great Krakow has been for that. I didn’t even look anything up but have run into all kinds of restaurants and cafes offering everything from vegan meat alternatives to corn flour pancakes to gluten free cupcakes. It has been such a delight after the “how many times can I have yogurt in one day” game. I have not had a bad coffee yet and Poland is a fan of bubble tea. If you are a foodie or have a various food concerns while traveling, fear not in Krakow (Warsaw held its own as well). I sure hope you got me that big teapot as a souvenir!